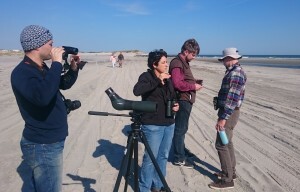 Two of our partnerships have developed social media guidelines: one is a Russia–United States collaboration; the other is between our East Atlantic flyway initiative, Migratory Birds for People, and the network of nature site managers, Eurosite. Wetland centres do a lot of work delivering activities with their visitors on site. Guided walks and talks, formal and informal learning sessions, citizen science and many other types of engagement. In addition, centres need to use modern forms of communication to reach their potential target audiences, to promote their activities, to coordinate with partners and share resources and data, and to ensure that their messages are passed on to those that may not ever visit their centre. During 2014/15, three centres in the US and three in Russia worked together through WLI, to exchange staff, share experiences and produce guidance on the themes of social media, data sharing and outreach. The project built great relationships between people and centres, and allowed them to identify key lessons for colleagues in other wetland centres too. If you are interested, please download the Manual – it is around 2 Mb in size, and available in English, Russian and Spanish. If you have any comments or questions, we would welcome you to contact the Head of WLI, or any of the partners involved, whose details are found in the document. Special thanks to the Wetlands Institute for delivering the project, the Peer to Peer programme for its generous financial support, Wetlands International Russia for technical help and advice, and of course to those wetland centre staff and volunteers that shared their experience so enthusiastically. The more recent manual emerged in 2018 when members of Migratory Birds for People (MBP) felt the need for a more detailed guide to getting started; Eurosite prepared this guide to work for their members and WLI members alike.